Britain has a competitive advantage to compete for a substantial share of the space market, as the nation will have launched an estimated 2,000 smallsats by 2030, this according to the nation's Business Secretary Greg Clark upon his visit on August 9 to the site of a future UK spaceport in Sutherland, Scotland. During the visit, the Secretary of State viewed plans for the spaceport site and held discussions with local citizens and businesses to hear their thoughts. Figures released to coincide with his visit suggest that existing ‘rideshare’ smallsat launches (small satellites piggybacking on larger missions) are capable of meeting less than 35 percent of the total demand. This reveals a significant gap in commercial smallsat launch provision, for which future UK spaceports are well placed to compete for these missions. The Sutherland spaceport will be developed by Highlands and Islands Enterprise (HIE). The HIE Board approved investment of up to £9.8m in the £17.2m facility. The agency earlier confirmed that the Sutherland spaceport was capable of supporting some 400 jobs. These would be a mix of new jobs as a result of activities at the spaceport, inward investment, and supply chain opportunities. Scotland is the best place in the UK to reach in-demand satellite orbits with vertically launched rockets. The UK Space Agency also previously announced a £2m scheme to support horizontal launch. The UKSA is driving the growth of the space sector as part of the Government’s Industrial Strategy with major initiatives including the National Space Test Facility at Harwell, and the UK continues to be a leading member of the European Space Agency, which is independent of the EU. Business Secretary Greg Clark said that from Britain's market leadership in small satellite construction, to the nation's world leading universities in Scotland, Britain can compete from a position of strength in the global space sector, which will be turbo boosted by the first new spaceport and Britain's Industrial Strategy.However, I want to make certain that this giant leap for the UK will also deliver on the ground, and that’s why I’m here today to discuss benefits in local jobs, uplifting tourism and businesses, helping to bring prosperity to all. Roy Kirk of HIE is project director for the Sutherland Spaceport development and he said that establishing the UK’s first spaceport in Sutherland is a fantastic opportunity for the Highlands and Islands, and for Scotland. The international space sector is set to grow very significantly in the coming years. We want to ensure our businesses are ready to benefit from the opportunities this will create. Establishing this launch site will create local opportunities, with around 40 high quality, skilled jobs in a fairly remote and rural part of Sutherland. Crucially, HIE believe sit will also stimulate further related investment and business activity more widely across the Highlands and Islands and other parts of Scotland. HIE will be working to develop supply chain opportunities locally and across the region and will also use the spaceport’s presence to attract and encourage further business activity and investment here in the longer term. 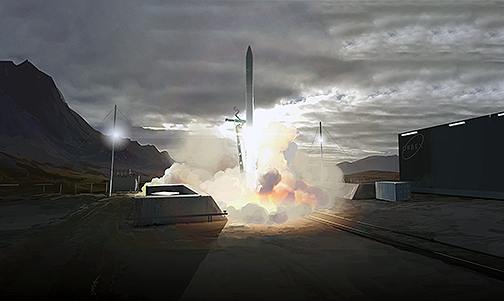 Artistic rendition of an Orbex launcher blasting off from the Sutherland, Scotland, spaceport. Image is courtesy of Orbex. Chris Larmour, Chief Executive of Orbex said he doesn't think anyone should underestimate the importance of what is being done in Scotland. 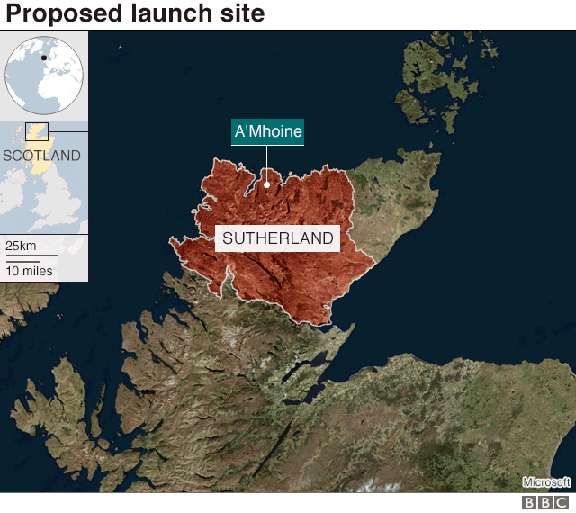 With Sutherland, continental Europe's first spaceport will be in place. Britain already has a strong satellite manufacturing capability and soon, with Orbex, there will be British rockets taking those satellites into orbit. This end-to-end capability is unique in Europe and will create a virtuous circle, leading to more investment, more business and more jobs. He continued by stating that the company s currently assessing locations in Scotland to house the firm's rocket factory and Spaceflight Mission Control facility, which will become Orbex’s global headquarters. Then the hiring process for 25 new jobs starts immediately, rising to around 130 jobs over time. The company has progressed rapidly over the past three years and the firm is already testing the engine of the Prime rocket. To that end, Orbex has secured £30 million in funding and has also signed up our first customer for 20 satellite launches. Quite quickly, Orbex expects the local economy and the wider British economy to start feeling the positive impact of this progress. Patrick Wood, Lockheed Martin’s UK Country Executive for Space, added that the company is moving quickly with teammates to establish detailed plans and infrastructure for this new launch capability. Lockheed Martin is already expanding its presence in Sutherland is searching for the first members of the Lockheed Martin team now. The company is committed to fast and meaningful progress to deliver regular, reliable and responsible access to space for the UK, with the first launch slated for the early 2020s.